Elvis Genbo Xu, Ph.D. is a postdoctoral researcher at University of California, Riverside (UCR), on the RECOVER project. Dr. Xu joined in Professor Daniel Schlenk’s research team at UCR in 2015 after four years as James Henry Scott Scholar in The University of Hong Kong. Principal research interests involve marine pollution, with particular emphasis on endocrine disrupting chemicals and toxicity, and integrated ecological risk assessment. Dr. Xu has published over 20 papers in the peer-reviewed literature on population genetics in marine fish and marine pollution. Areas of expertise include molecular biomarker development, gene expression, ecological risk assessment, and chemical analysis. Dr. Xu graduated from Chinese National Training Base (2007) and obtained his BSc (2007) from the Ocean University of China, MPhil (2010) from Chinese Academy of Fishery Sciences, China, and PhD (2015) from the University of Hong Kong, Hong Kong, at the Swire Institute of Marine Science. 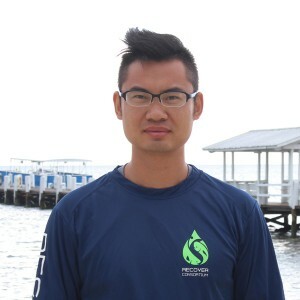 As a marine scientist, Dr. Xu concerns marine environment protection and conservation. Dr. Xu is intrigued by the attempt to identify molecular mechanisms of action for Deep Water Horizon (DWH) oil-induced toxicity in the coastal (redfish) and pelagic (mahi-mahi) fish from the Gulf of Mexico, and its combination with whole animal physiology and behavioral studies, which will provide a greater understanding of the impact of DWH oil to the marine environment.